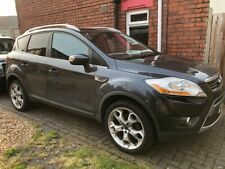 Ford Kuga Titanium X - 2008/58 - PLEASE READ!! Factory Ford upgraded stereo system. The car does run and drive but smokes heavily. - FSH with service book. - Full leather interior with heated front seats. - MOT expires August 2019. - HPI CLEAR. 59 Ford Kuga 2.0TDCi Titanium Damaged Salvage Repairable 1 Owner!! 70k Drives, Mega Spec, Easy Repair, Cheap Kuga! Ford Kuga 2L TDCI. Runs and drives with no faults. Cash or transfer on collection. For sale is our ford kuga zetec. It has 4 wheel drive and is the higher speed engine. Parking sensors. Air conditioning. Electric windows. Ford Kuga 2.0 TDCi Titanium 4x4 5dr PREVIOUS LADY OWNER//LONG MOT TILL SEPTEMBER 2019//HALF LEATHER//GOOD CONDITION INSIDE & OUT//12 MONTH WARRANTY COVER INCLUDED//JUST BEEN FULLY SERVICED//WARRANTED MILEAGE WITH ALL PREVIOUS MOT PRINTOUTS AND COMPLETE VOSA CONFIRMATION//DRIVE-AWAY INSURANCE//WE ACCEPT ALL MAJOR CREDIT/DEBIT CARD PAYMENTS//NATIONWIDE DELIVERY ALSO AVAILABLE// FOR MORE INFORMATION PLEASE CALL OR TXT ON 07852556157. Ford kuga 2.0 titanium 2010. HQ Motors - Call us on 441144780031 or click here to find out more.